US Pants in 30" 32" 34" 36" 38"
Measurements refer to body size not garment dimensions. Chest (1): Measure the chest under the arms around the fullest point. 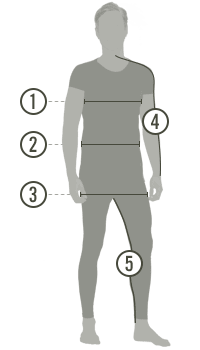 Waist (2): Measure at the smallest part of the waist, often at or above the belly button, below the ribs. Hip (3): Measure the hip circumference at the fullest part of the seat. Sleeve Length (4): Measure the distance from the prominent bone on the spine at the neck, across the shoulder, over the bent elbow to the center of the wrist bone. Inseam (5): Measure the distance from the crotch point to the bottom of the ankle.